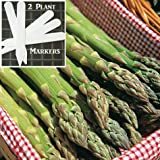 Asparagus plant for sale is available in bulbs or crowns (1 year old plants) and is best planted in the early spring as soon as the soil can be worked. It may take 2 to 3 years to get it established and produce but can be productive for up to 20 years. Asparagus has male and female plants, with the female plants producing berries. Regions with cool winters are best for this cool-season crop. Location – Choose a sunny site on the edge of your garden without any weed competition and where it will not be disturbed by the activity of planting and re-planting in other areas. If there are tenacious weeds or grass, treat with an herbicide used with food crops, or cover the area with black plastic during the summer before planting to eliminate problems in the future. Soil – Asparagus does not like having “wet feet”. Make sure your soil is well-draining. For this reason, a raised bed can be a good place to plant asparagus. Work your soil with 2 to 4 inch layer of compost, manure or soil mix. Planting – Dig trenches of about 6 inches wide and 6 to 12 inches deep. Create a mound and plant the crowns 15 to 18 inches apart. Cover the roots and crown with 2 inches of soil. Fill in the rest of the trench with soil as the stems grow, leaving 3 to 4 inches of stem exposed. Add a 4 to 8 inch layer of mulch and water regularly. Fertilizer – Feed you asparagus with fertilizer at the time of planting and twice a week through the summer. This will give it the best growth possible during its first season. Pruning – Cut back the 4 to 6 foot tall foliage or ferns when frost has turned them brown. This is a good time to control weeds because the asparagus are dormant. Cut down dead foliage in late fall and side-dress with compost. Female plants produce berries and may hinder growth of the spears, you may cut off the berries to help the plant concentrate the nutrients and energy in growing spears. Harvesting – Do not harvest the spears in the first year to give the crown a chance to get well established. It can take 3 growing seasons before you can harvest your asparagus. Patience is the key, although you may be able to do some light harvest during the second year. For the following years, maintain the bed and harvest only the spears thicker than a pencil. Once the spears start to show, you can harvest for a period of about 2 to 3 weeks. After harvest, allow the ferns to grow; this replenishes the nutrients for next year’s spear production. 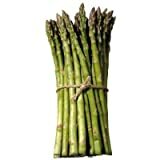 Fresh asparagus spears can be stored a week or more. If you want to put some aside to enjoy in the months to come, blanch them in boiling water for 3 to 5 minutes, douse in cold water, wrap, and freeze.